The Moment £170,000-A-Week Chelsea Star Eden Hazard KICKS Ballboy In Ribs - kaycee Weezy! Footballer Eden Hazard provoked fury tonight when he kicked a ballboy in the ribs during a match. Chelsea's 22-year-old Belgian star striker - who earns a whopping £170,000 a week - was sent off after the incident in the 80th minute of the League Cup semi-final at Swansea City’s Liberty Stadium. Hazard, who joined the west London club for £32million last summer from French side Lille, tried to regain the ball after it went out of play late in the second leg of the game, which finished 0-0. The Swansea-employed ballboy fell to the ground, landing on the ball and smothering it, apparently infuriating the striker. In Hazard’s attempts to get the ball he tried to kick it from beneath the ballboy. Instead he made contact and kicked him in the ribs, before he finally grabbed the ball from beneath him and ran off. Several Chelsea players went to tend to the ball boy, who was left holding his ribs. 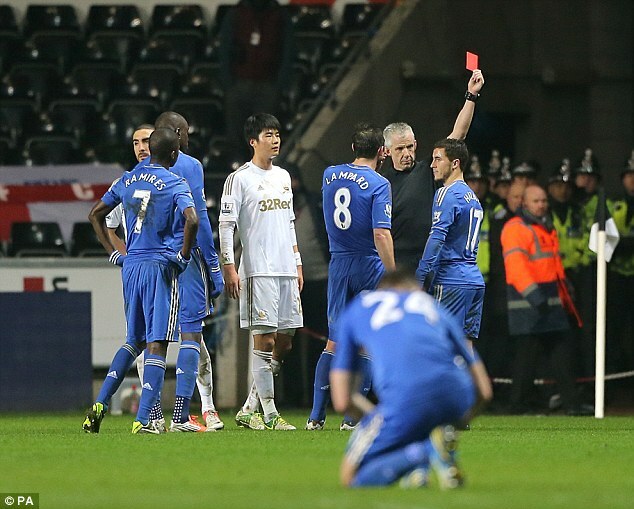 But they reacted angrily when Hazard referee Chris Foy produced a red card. The Chelsea players claimed he had tried to get the ball loose to restart play as the clock ticked down. The cup tie marked a impressive victory for Swansea, who will go through to Wembley for the first cup final in their 100-year history after winning 2-0 on aggregate thanks to their first-leg success. Twitter users reacted strongly to the incident, branding Hazard a 'disgrace', 'scumbag' and 'animal’. Footballers Michael Owen and Robbie Fowler also waded into the debate.